The other day a friend from work sent me something on Facebook that showed a picture of Nicholas Cage, taken from the film National Treasure, with the caption; “Them: Who you gonna vote for, Me: I’m gonna steal the Declaration of Independence.” All day long I had the urge to watch that film but another part of my mind was at work tossing ideas around. What you are about to read is the result of all that subconscious thinking. Thanks to my friend, who for the time being shall remain anonymous. What would happen if someone did, in fact steal the Declaration of Independence, or the Constitution and Bill of Rights for that matter? I can lay out a possible scenario, if you care to read it. I’m pretty sure the media would cover it non-stop; just like they do terrorist attacks and mass shootings. I’m sure the president would give an address to the nation saying all kinds of patriotic rhetoric, and calling upon whomever stole them to return them unharmed. I’m also sure that the full weight of the Justice System would be brought to bear on finding who stole them and returning them to their place at the National Archives. I’m also pretty sure that the most of the American people, even those who had never read a word from those documents, would be incensed at whoever took them, and if that person were ever captured his name would be lumped into the category of men like John Wilkes Booth and Lee Harvey Oswald; men who had assassinated presidents. Yet let’s say for a moment that I was to make Xerox copies of those same documents and mail one copy each to every man, woman and child in America; all 318 million of them; what do you think they would do with them? I’m betting that well over 90% of the people who got them in the mail would not bother to read them; with most of them tossing them into the trash. What I’m trying to show you is the significance people place in those documents. They have become, just as the movie is titled, National Treasures, while the concepts and principles contained within them have been forgotten and forsaken. I’m truly curious as to how many of those who plan on voting in two weeks even know that without the Constitution they would NOT be voting for a president? Were it not for the Constitution, all this country would have to govern it would be a Congress. Don’t you think it would be prudent to read what that document has to say are the powers granted those for whom you are about to cast your votes? I don’t watch sports on TV anymore; aside from the occasional tennis match when Wimbledon is going on. Yet a great many Americans are rabid football fans. If football players were to disregard the rulebook and defensive linemen were to start facemasking and clotheslining running backs and receivers, serious injury would become part of the game. If the offensive line were capable of using their hands to hold back pass rushers, then the game would change as well. If the quarterback were allowed to do anything he wanted to advance the ball down the field then forward laterals would become legal and the game would change. But the NFL has a rulebook, and the fans get mighty upset when violations of the rules go un-penalized. Why is it then that these same people will go to the polls and cast their votes for candidates whose campaign promises clearly violate the rulebook for our government? After all, aside from the loss of money due to side wagers on the games, nothing that happens in the NFL truly affects your lives and your future; yet the decisions these people you elect make shape the course of your future and your liberty. Why is it that so many people place more importance upon the rules for a sporting event than they do the rules for their government; or place the status of our founding documents as national treasures above the actual principles contained within those documents? Hmmm, can you answer that for me? 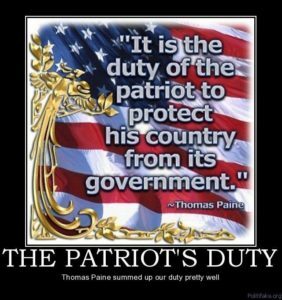 Yet people all the time tell me that because I have chosen not to vote in the upcoming election that I am not doing my civic duty, that I am unpatriotic or un-American. Let me ask you people something. If you had to choose for a babysitter between someone who had a criminal record for taking photographs of naked children, or someone who had a criminal record for molesting children; whom would you choose? Or, would you make the choice not to find a babysitter and keep your children safe? It’s the same with elections for me. If I can’t find a candidate who will adhere to the limits the Constitution imposes upon the office they seek, and who will safeguard my liberty to the best of their ability, then I won’t vote for any of them. It is because I have studied the founding of our country; read the things those who wrote these documents people treasure, but ignore, and know what limits they impose upon our government. I take those limits seriously, and if I can’t find a candidate I believe will adhere to those limits, or seek to undo the damage done by past presidents and Congresses, then I will not vote for someone who can only make things worse. You see, I, as well as many other Americans, once took an oath to support and defend the Constitution of the United States against all enemies; foreign AND domestic. I take that oath very seriously, and it would be a breach of my oath to willingly vote for a candidate simply because they are the lesser of two evils, or that they made the best sounding promises; especially when the things they promised clearly are a abuse of the power granted the office they seek. Yet millions of the people are going to go to the polls in two weeks and do just that; vote for the candidate they believe to be best qualified, or made the most convincing argument as to why they are the better choice for president; all the while nary a handful of voters have read the document that outlines the powers granted government, and the limitations imposed upon it. There are many words to describe such action; insane, foolhardy, idiotic, and unintelligent being a few of them. Yet these Americans are firm in their belief that they are doing their civic duty; that they are patriotic. One of our lesser known Founders, Fischer Ames, once said, “I am commonly opposed to those who modestly assume the rank of champions of liberty, and make a very patriotic noise about the people. It is the stale artifice which has duped the world a thousand times, and yet, though detected, it is still successful.” Could that be because, for the most part, people allow emotion to guide their decision making process rather than a close examination of how well the things a candidate says conform to what the Constitution authorizes them to do? People today are so caught up in this two party paradigm; Republicans versus Democrats; liberals versus conservatives, that they fall to realize there are but two obvious choices; those who will support and defend the Constitution, and those who will work to tear them down. If you are voting for a candidate because they are not the one you wanted, but they are better than the other guy, then you are probably voting for one who is in the category of those who will work to tear down the Constitution and Bill of Rights. Yes, someone has got to be elected, someone has to become the next president; but do you, if you honestly care about the principles contained in our founding documents, have to participate in choosing who that candidate will be when neither of them are fit to serve? John Quincy Adams, son of our nation’s second president, and 6th President of the United States, once said, “Always vote for principle, though you may vote alone, and you may cherish the sweetest reflection that your vote is never lost.” I would add, that if there are no candidates of principle, DO NOT VOTE FOR ANY OF THEM! The whole point of this commentary is the divide between the reverence given our founding documents and the principles contained within those founding documents. People show the Declaration of Independence and Constitution a great deal of respect as far as a national treasure goes, but they ignore the words contained within them. So I suppose there is but one question left to ask. Are you a patriot who stands for the principles contained within our founding documents, or are you among those who are working to tear those principles down? I did not want to include this in the main body of this article, but wanted to make sure it was included as an afterthought. For those of you who plan on voting for Hillary, there is something you should read, as by your voting for her you are among those who care little for the principles contained in our founding documents, or the character of the candidate you intend to vote for. While FBI Director James Comey may not have chosen to push forward and indict Hillary Clinton for her e mail server scandal, US Law still declares her actions to be a crime, and also make her ineligible to hold office. Title 18 of the United States Code, Section 2071, states, “(a) Whoever willfully and unlawfully conceals, removes, mutilates, obliterates, or destroys, or attempts to do so, or, with intent to do so takes and carries away any record, proceeding, map, book, paper, document, or other thing, filed or deposited with any clerk or officer of any court of the United States, or in any public office, or with any judicial or public officer of the United States, shall be fined uder this title or imprisoned not more than three years, or both. So you see, even though Director Comey said Hillary may have been negligent, but not criminal, in her actions, his ruling runs counter to what the U.S. Code actually says regarding Ms Clinton’s actions. Whatever his reasons were for not indicting Hillary Clinton were it does not erase her guilt. And if you are voting for her, just know that you are voting for a criminal who has gotten away with a serious crime, and one who, had she any ethics at all, should have dropped out of the race. So tell me again, who is patriotic and who isn’t?